Carmarthenshire falls within the Swansea Bay City Region. Carmarthen -- the county town of Carmarthenshire, bustling market. Llandeilo -- picturesque market town. Llandovery -- picturesque market town. The pictureque river-side village of Trapp - a few miles from Llandeilo, near Carreg Cennen Castle. Carmarthenshire is a largely rural county and has rich farmland and a large agricultural industry. It has some of the most fertile land in Wales and is known as the Garden of Wales. 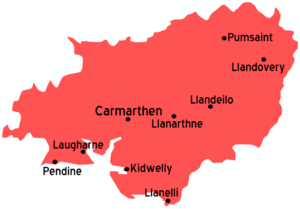 Carmarthenshire is an ancient county and historically the largest traditional county of Wales, which modern Carmarthenshire shares roughly the same boundaries. The Prince of Wales's Welsh home is located near the village of Myddfai in Carmarthenshire. The M4 Motorway connects Carmarthenshire with Swansea and destinations to the East, eventually reaching London. The M4 terminates at the Pont Abraham Roundabout, approximately 15 miles south east of Carmarthen and serves Llanelli. The A48 conntects Carmarthen to the M4 at Pont Abraham. The A48 then continues along a route similar to the M4 heading eastwards. The A483 connects towns in eastern Carmarthenshire to places in mid and north Wales and Chester. The A40 is a major east-west route beginning from London and ending at Fishguard which passes through Carmarthen. East of Carmarthen, the A40 skirts the northern edge of the Brecon Beacons and passes the town of Brecon. Arriva Trains Wales run the vast majority of Services in the area, with First Great Western running a small number of through trains to London. Train services from Shrewsbury, via central wales on the scenic Heart of Wales Line call at Ammanford and Llanelli. The only east-west line through Carmarthenshire is the West Wales line on which direct Arriva Trains Wales services from Manchester, Newport, Cardiff and Swansea call at Llanelli and Carmarthen as well as many other smaller stations. First Great Western trains from London only run directly to Llanelli and Carmarthen during the summer months. At other times, a change at Swansea or Newport is required. National Express operate coach services to Carmarthen from Blackpool, Birmingham and London (Victoria). The TrawsCambria service from Cardiff Bay to Aberystwyth calls at Carmarthen. To Llanelli, National Express operate regular coach services from London (Victoria). Pembrey Airport in the south of Carmarthenshire handles private light aircraft. Charter company South Western Airlines operate out of Pembrey Airport. The ferry ports at Pembroke Dock and Fishguart are approximately an hour away from Carmarthenshire, offering ferry services between south Wales and Ireland. The best way to travel around Carmarthenshire is by private car. Carreg Cennen Castle  - an imposing castle located north of Swansea, a few miles from Llandeilo off the A483. Cafe and gift shop. There is an admission fee payable at the cafe/gift shop. Black Mountain, the range of mountains on the far western part of the Brecon Beacons National Park falls within Carmarthenshire. This part of the Brecon Beacons is far less visited than the central and western parts but is no less spectacular. National Botanical Gardens of Wales - Middleton - Llanarthne. Tel: +44 1558 668768. - adults £7.00, children (5-15) £2.00, family (2 adults, 4 children) £16.00. Scarlets, a professional side who play in the Pro 12 League, their home ground is Parc Y Scarlets in Pemberton, Llanelli. Llanelli offers the best opportunities in Carmarthenshire. Llanelli has the best collection of pubs and bars in Carmarthenshire. The area is by and large bi-lingual. Welsh and English are both widely used. Brecon Beacons National Park - a short drive from Carmarthenshire will take you into this land of lakes, mountain peaks and Celtic mystery. Cardiff - Wales' capital city - castle - shopping - between 1 - 1 1/2 hours by car. There timetabled train services to Cardiff from Carmarthen and Llanelli as well as other smaller village stations. Direct bus services to Cardiff are available at Carmarthen and Llanelli. Pembrokeshire Coast National Park the only coastal national park in the UK, found just to the West of Carmarthenshire. Swansea and Gower peninsula - Wales second largest city lies just to the south east of Carmarthenshire for shopping, leisure, nightlife and restaurants. There are frequent bus and train connections from Llanelli and Carmarthen. This page was last edited on 13 July 2018, at 08:13.